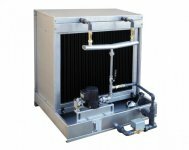 Evaporative Media Pad Humidifiers/Coolers with an unique media pad in the market with high efficiency, lower pressure drop and hygienic certified. Complete construction in stainless steel AISI304. High efficient/hygienic evaporative media pad. Non-combustible (Fire-Proof tested) inorganic (fiber glass) evaporative media pad. Glue free media pad assembly that allows high saturation efficiency and low pressure drop. Works with all type of water including demineralized water. Silver ion on media pad surface (anti bacterial and fungus protection). Media pad assembled in standard cassettes for maintenance and replacement purposes. Allows maintenance by sides or front. Easy and fast “slide in” assembly in the AHU. High efficient irrigation system developed for a uniform distribution of water in the media pad. Droplet separator in PolyPropylene material VDI 6022 certified. Droplet separator “ready”, when is not selected. Complete draining of the water to comply with hygienic standards. Hygienic Certified according the VDI 6022 standard. Standard available sizes from 570 mm x 350 mm (425 m3/h@2,5 m/s) up to 3075 mm x 2400 mm (55.000 m3/h@2,5 m/s), in one piece assembly, and up to 6150 mm x 4800 mm in modular assembly (220.000 m3/h@2,5 m/s). Humidification/Cooling of the supply air. 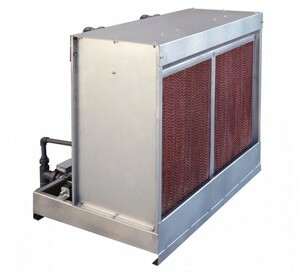 Cooling of the return/exhaust air to increase the efficiency in the Heat Exchanger (wheel or plate cross/counter flow).